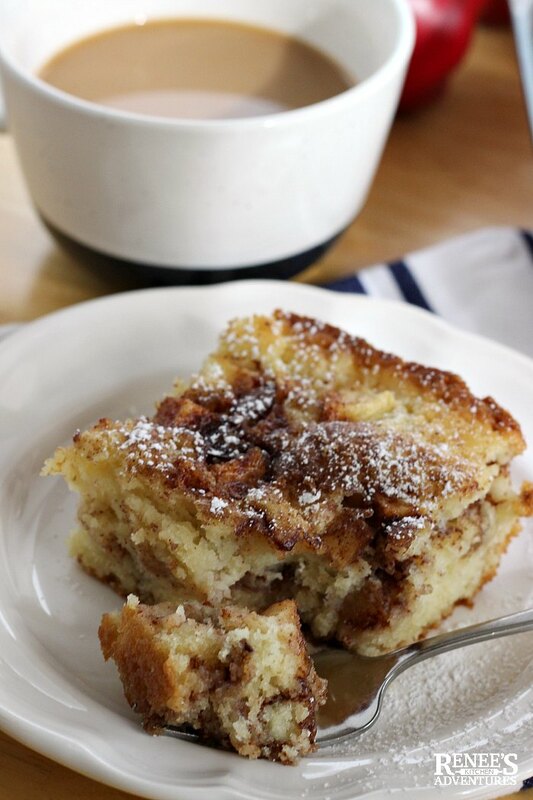 Apple Cinnamon Coffee Cake is a delicious way to start your day or perk up an afternoon. Tender buttermilk based coffee cake is studded with fresh apples and lots of brown sugar cinnamon then topped with a dusting of powdered sugar for a treat that's as easy to make as it is to eat! As the weather turns cooler, I'm all about lazy Sunday mornings and big hearty breakfasts. On any given Sunday morning, you'll find me in my kitchen serving up recipes like my Lemon Ricotta Pancakes and my son's favorite Easy Peasy Buttermilk Biscuits. Sunday morning breakfast has become somewhat of a tradition in my house ever since my kids were little. Even now with the kids gone and moved out, I still make a hearty breakfast for my hubby and myself. Now, I've got a new favorite to add to the Sunday morning line up...Apple Cinnamon Coffee Cake. Trust me when I say, you need this fresh apple cake recipe in your life! 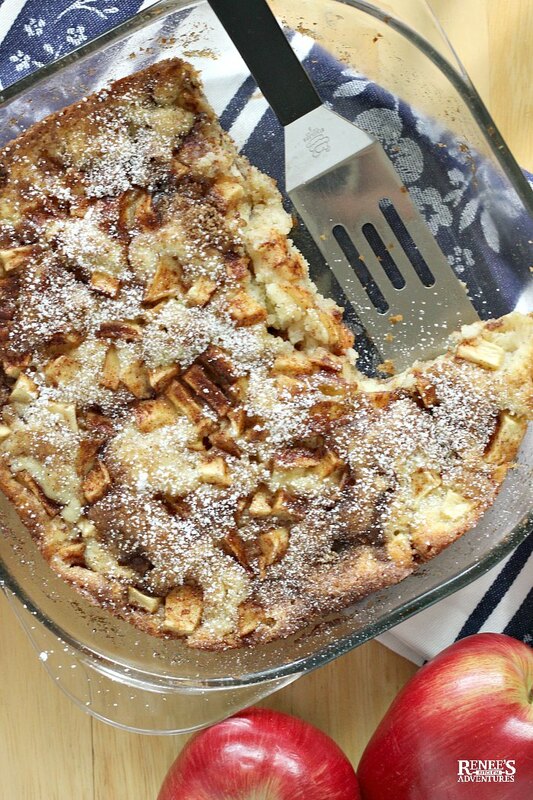 How do you make Apple Cinnamon Coffee Cake? What could be better than a warm tender cake (thanks to the buttermilk!) dotted with sweet apple pieces and an over the top brown sugar cinnamon swirl? Let me answer that for you. Nothing. That's what. If you are looking for a quick and easy apple coffee cake recipe, then you've come to the right place. 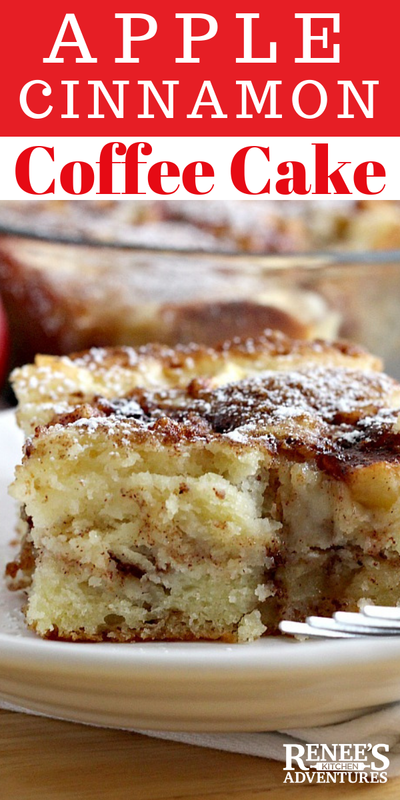 This apple coffee cake recipe is easy to make! Just like with any quick cake or bread recipe, making sure you don't over mix the batter is key. Over mixing the batter will tend to produce a tough cake, so just don't do it! Once you've got the batter all mixed up, the apple and brown sugar cinnamon are simply layered over the batter in two steps. I've already mentioned this fresh apple cake recipe is excellent for a lazy breakfast, but it's also great for an afternoon pick me up with a cup of coffee or tea. (Can you believe when I was a kid I thought coffee cake had to be only eaten while sipping a cup of coffee?!) Apple Cinnamon Coffee Cake also would make an awesome dessert when served with a scoop of vanilla ice cream! I used Cortland apples in this apple cinnamon coffee cake recipe. Some of my favorite apple varieties to bake with include Cortland apples, Gala apples, and Jonagold apples. You can use whatever apple variety you like. Here is a handy guide to help you decide what kind of apple to use for this coffee cake courtesy of one of my favorite local Ohio apple orchards. You might have different apple varieties available to you according to where you live. Can I make Apple Coffee Cake Muffins? This apple coffee cake recipe can easily be made into muffins instead of a whole cake. Simply adjust the bake time (would be slightly shorter). I love baking with apples this time of year! If you like this apple cinnamon coffee cake recipe, you may also want to give Old Fashioned Fresh Apple Cake and this Apple Rum Raisin Cake a try! Apple Cinnamon Coffee Cake is an easy to make, tender coffee cake studded with fresh apples, brown sugar, and cinnamon for a sweet apple treat any time of the day! In large bowl, combine the flour, salt, and baking powder with a whisk. In large 4 cup measuring cup, whisk together the sugar, oil, eggs, buttermilk, and vanilla extract. Pour the wet ingredients into the flour mixture and MIX UNTIL JUST COMBINED. Do not over mix! Spread 1/2 the batter into the prepared pan, Top with half the apples and half the reserved brown sugar/cinnamon mixture. Press down slightly. Spread remaining batter over the apples and then top with remaining apples and brown sugar/cinnamon. 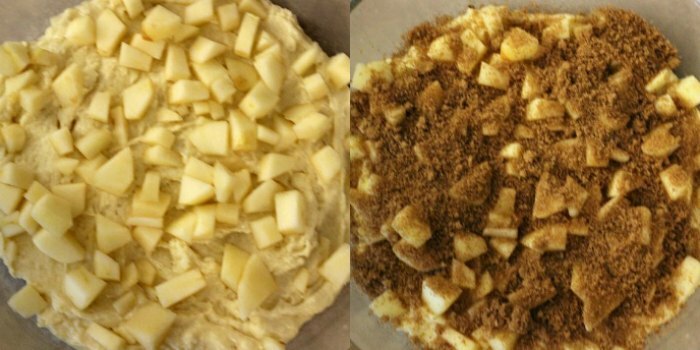 With a knife, swirl the batter to swirl the apples and cinnamon into the cake. Bake in oven for 40 - 45 minutes, or until toothpick inserted into center comes out clean. All ovens bake differently, so make sure you use the toothpick to ensure the middle is done! Allow to cool for 15 minutes, dust with powdered sugar (if desired), and enjoy warm! While this cake tastes great warm or cool, it's best enjoyed while it's warm from the oven! A cooled cake can be reheated in the microwave for a few seconds before serving. Nutrition information is an estimate. 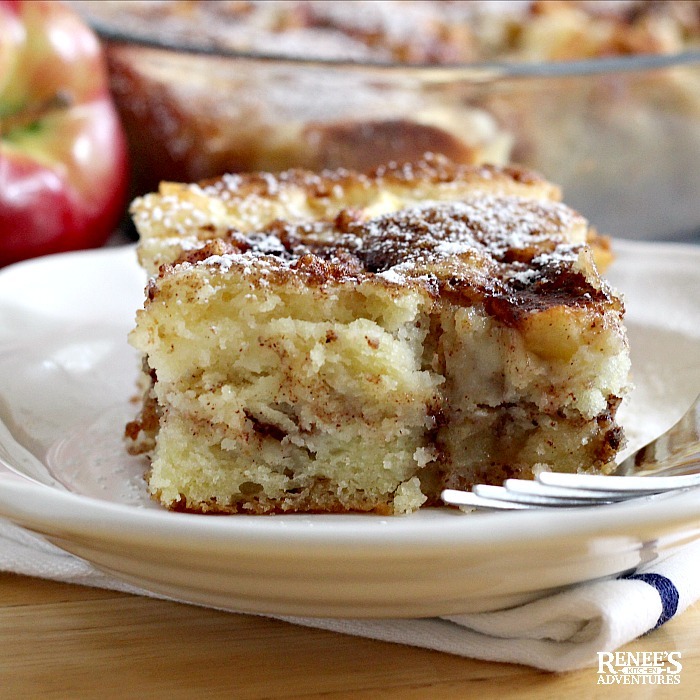 Don't forget to pin Apple Cinnamon Coffee Cake to your Pinterest boards! You had me at coffee cake! This looks amazing. I love love love all the fresh apples and cinnamon. This cake is soooo good!! The fresh apples and cinnamon really make the cake! Thanks so much for stopping by!